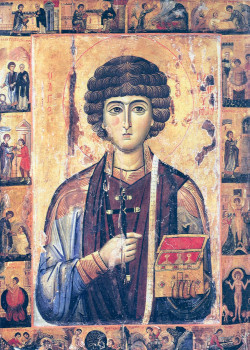 The Great Martyr and Healer Panteleimon was born in the city of Nicomedia into the family of the illustrious pagan Eustorgias, and he was named Pantoleon. His mother Ebbula was a christian. She wanted to raise her son in the Christian faith, but she died when the future great martyr was still a young lad. His father sent Pantoleon to a fine pagan school, at the completion of which the youth began to study the medical art at Nicomedia under the renowned physician Euphrosynos, and he came to the attention of the emperor Maximian (284-305), who wished to see him at court. During this time there dwelt secretly at Nicomedia the priests Hermolaus, Hermippus and Hermocrates – survivors in the Nicomedian Church after the burning of 20,000 Christians in the year 303. Saint Hermolaus saw Pantoleon time and again, when he came to their hideout. One time the priest summoned the youth to the hideout and spoke about the Christian faith. After this Pantoleon visited every day with Hermolaus. One time the youth saw upon a street a dead child, bitten by a viper, which was still alongside. Pantoleon began to pray to the Lord Jesus Christ for the resuscitation of the dead child and for the death of the venomous reptile. He firmly resolved, that if his prayer were fulfilled, he would become a follower of Christ and accept Baptism. The child revived, and the viper shattered into pieces before the eyes of Pantoleon. After this miracle Pantoleon was baptised by Saint Hermolaus with the name Panteleimon (meaning “all-merciful”). Conversing with Eustorgias, Saint Panteleimon prepared him for the acceptance of Christianity, and when the father beheld how his son healed a blind man by invoking the Name of Jesus Christ, he then believed in Christ and was baptised together with the blind man restored to sight. After the death of his father, Saint Panteleimon dedicated his life to the suffering, the sick, the unfortunate, and the needy. He treated without charge all those who turned to him, healing them in the Name of Jesus Christ. He visited those held captive in prison – being usually christians, who filled all the prisons, and he healed them of their wounds. In a short while accounts about the charitable physician spread throughout all the city. Forsaking the other doctors, the inhabitants began to turn only to Saint Panteleimon. The envious doctors made a denunciation to the emperor, that Saint Panteleimon was healing Christian prisoners. Maximian urged the saint to disprove the denunciation and offer sacrifice to idols, but Saint Panteleimon confessed himself a Christian and right in front of the eyes of the emperor he healed a paralytic in the Name of Jesus Christ. The ferocious Maximian executed the healed man who was glorifying Jesus Christ, and gave Saint Panteleimon over to fierce torture. The Lord appeared to the saint and strengthened him before his sufferings. They suspended the Great Martyr Panteleimon from a tree and tore at him with iron hooks, burned him with fire and then stretched him on the rack, threw him in boiling oil, and cast him into the sea with a stone about his neck. Throughout all these tortures the great martyr remained unhurt and with conviction he denounced the emperor. During this time there was brought before the court of the pagans the Priests Hermolaus, Hermippus and Hermocrates. All three firmly confessed their faith in the Saviour and were beheaded. By order of the emperor they threw the Great Martyr Panteleimon to wild beasts for devouring at the circus. But the beasts lay at his feet and shoved at each other in trying to be touched by his hand. The spectators gathered together and began to shout: “Great God of the Christians!” The enraged Maximian ordered the soldiers to stab with the sword anyone who glorified the Name of Christ, and to cut off the head of the Great Martyr Panteleimon. They led the saint to the place of execution and tied him to an olive tree. When the great martyr prayed, one of the soldiers struck him with a sword, but the sword became soft like wax, and inflicted no wound. The saint ended the prayer, and a Voice was heard, calling the passion-bearer by name and summoning him to the Heavenly Kingdom. Hearing the Voice from Heaven, the soldiers fell down on their knees before the holy martyr and begged forgiveness. The executioners refused to continue with the execution, but the Great Martyr Panteleimon bid them to fulfill the command of the emperor, saying that otherwise they would have no share with him in the future life. The soldiers tearfully took their leave of the saint with a kiss. When the saint was beheaded, the olive tree – to which the saint was tied, at the moment of his death was covered with fruit. Many that were present at the execution believed in Christ. The body of the saint – thrown into a bonfire – remained in the fire unharmed and was buried by christians (+ 305). The Great Martyr Panteleimon’s servants Lawrence, Bassus and Probius saw his execution and heard the Voice from Heaven. They recorded the account about the life, the sufferings and death of the holy great martyr.